It was a long week -- thankfully it is a long weekend. All the veggies from past weeks' boxes are in excellent shape thanks to Evert-Fresh bags. There's lots to love in the pile of veggies we have to manage over the next week. The strawberries were immediately added to my "smoothie" bag in the freezer. 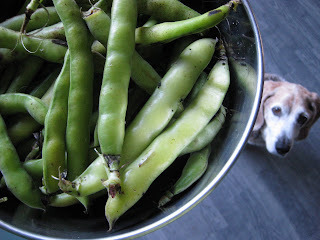 I actually like shucking the beans, which I find a somewhat Zen-like experience. It is a bit similar to gardening: lots of concentration, no deep thought and tangible results. Cooperative friends and family, and a bottle of wine help. 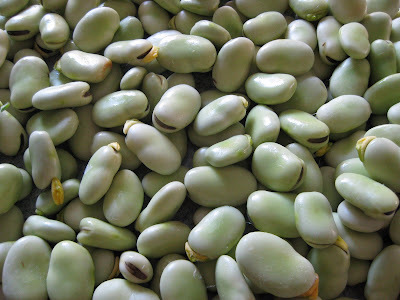 Preparing the beans takes a few steps: stringing the pods, blanching the beans and removing their casings. I prepped the beans pictured here this morning (without the bottle of wine! ), all together it took about an hour. 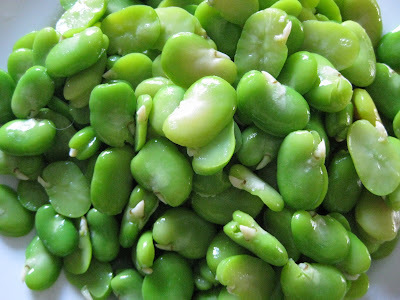 My favorite way to eat favas is sauteed with a bit of garlic and olive oil. While we may end up there, given the time and ingredients on hand, my plan is to try Bobby Flay's Fava Bean Salad with Lemon Vinaigrette and Shaved Manchego Cheese. Along with the favas, we'll have green garlic risotto, incorporating both the green garlic and the purplette onions. As far as the spinach goes, I'd like to try Heidi Swanson's Spinach-Mushroom Quiche with a side of her Baked Carrot Oven Fries, consuming the carrots.